The Lycopodiales includes homosporous, eligulate, usually dichotomously branched herbaceous plants. The group is represented today by four genera, Lycopodium (with ~476 species; sometimes subdivided into two to several genera), Huperzia (~439 species), Lycopodiella (~41 species), and Phylloglossum (1 species). These are generally small herbaceous plants covered with scalelike microphylls; they have true roots, which arise adventitiously from a horizontal rhizome. All are homosporous and today the order is cosmopolitan in distribution. The fossil members are not well understood, and although the group itself is ancient, there is some ambiguity as to whether some extant members are of recent or ancient origin (Wikström and Kenrick, 2001). The generic name Lycopodites was first used to describe some Cenozoic axes bearing small, scalelike leaves. The fossils were later determined to be fragments of conifer shoots. Today the morphogenus includes axes with helically arranged or pseudowhorled scale leaves and, if present, sporangia on the adaxial leaf surface, in the axil of foliage leaves, or in monosporangiate strobili. Specimens of Lycopodites (FIG. 9.96 ) have been described from rocks ranging from Devonian to Pleistocene (Kräusel and Weyland, 1937; Harris, 1976a; Krassilov, 1978; Rigby, 1978b), and they include forms that are both isophyllous (one type of leaf) and anisophyllous (two types of leaves). There is a report of Lycopodites from the Paraná Basin in South America (Ricardi-Branco and Bernardes-de-Oliveira, 2002; Jasper et al., 2006) and if accurate, it represents the only occurrence of the genus in Gondwana, with the possible exception of the enigmatic Lycopodites amazonica that has been described from the Middle Devonian of Brazil (Dolianiti, 1967). figure 9.96 Lycopodites sp. (Pennsylvanian). Bar = 2 cm. or until more complete plants can be reconstructed based on compression specimens. Ultimately, epidermal features, including the distribution and type of stomata, may be useful in separating distal twigs of the arborescent lycopsids from axes of the herbaceous forms. of the sporophyll and partially fills the sporangium cavity. Nothing is known about the spores. The genus is regarded as a herbaceous lycopsid, rather than the distal branches of an arborescent form, because there are no secondary tissues in the vascular system and cortex. Based on our current knowledge of stem development in the arborescent lycopsids, however, this distinction may be less certain. Cordaitales (Chapter 20). Associated in the same rocks are well-preserved vegetative axes that are placed in the genus Lycopodites. Although morphologic and cuticular features suggest affinities with that taxon, the presence of a ligule associated with each leaf may warrant inclusion within the Selaginellales (Skog and Hill, 1992). Onychiopsis psilotoides is a fossil from the Lower Cretaceous (Wealden) of England with a complex nomen-clatural history. Originally thought to have affinities within the polypodiaceous ferns, Skog (1986) reinterpreted some specimens as herbaceous lycopsids and transferred these to a new genus, Tanydorus (Skog, 1986). She later noted, however (Skog, 1990), that the type specimen for O. psilotoides was missing and thus was unable to confirm that it conformed to the genus Tanydorus. Skog (1990) therefore designated a new type and named the lycopsid taxon Wathenia. This genus is characterized by helically arranged, decurrent, simple leaves, each with a single vein. Leaves have acute tips and sporangia occur in the axil of the leaves. Spores are trilete and foveolate (ornamented with small pits). 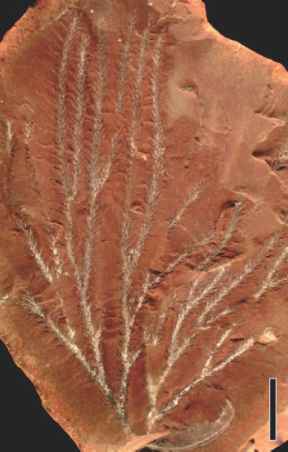 Onychiopsis remains a genus for fossil ferns and is discussed in Chapter 11. Small (3 mm in diameter), eligulate permineralized cones from the Middle Pennsylvanian of Kansas are also thought to have been produced by herbaceous lycopsids (Baxter, 1971a). Carinostrobus has an exarch protostele and helically arranged sporophylls. The sporangium was attached to the adaxial surface by a delicate pedicel; spores were small (2022 pm), trilete, and covered by minute spines. Another per-mineralized Carbonifereous cone in which the sporangium is attached by a short stalk is Spencerites (Berridge, 1905) (FIG. 9.98). 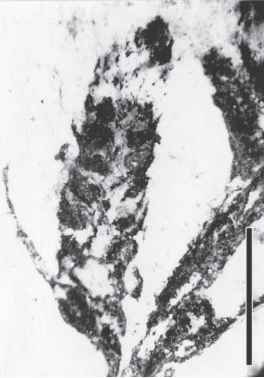 Spores of S. moorei are triangular in outline and characterized by an equatorial bladder that is also triangular in outline (Leisman, 1962; Leisman and Stidd, 1967). It is difficult to determine whether cones with Spencersporites spores are mono- or bisporangiate. 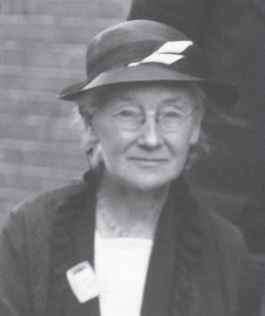 figure 9.98 Emily M. Berridge. (1984b) classification of impression-compression lycopsid stem genera. Fertile branches in the same rocks that contain Bumbudendron consist of reflexed, keeled sporophylls. From the same rocks these authors also described Malanzania. The stems of this lycopsid are narrow (1.3 cm wide) and contain widely spaced spines. Brasilodendron is an arborescent Permian lycopsid bearing persistent leaves up to 4 cm long (Chaloner et al., 1979; Jasper et al., 2006). On the abaxial surface of the leaf are two stomatal bands containing numerous, sunken stomata. Leaf bases are fusiform and no ligule has been observed. Several megaspores were recovered from the same matrix as the vegetative stems. They range from 800-1340 pm in diameter and are most similar to Lagenoisporites brasiliensis. Based on vegetative remains, Brasilodendron appears most similar to Ulodendron. As no ligule or ligule scar has been observed, Brasilodendron is discussed here in the Lycopodiales rather than with the other arborescent forms in the Lepidodendrales. Absence is not definitive evidence, however, as ligules may not have been seen due to preservation or to the persistent nature of the leaves. Brasilodendron is also comparable to Azaniadendron, an Early Permian, presumably eligulate, lycopsid from South Africa (Rayner, 1986). The vegetative axes in this taxon exhibit circular-oval leaf cushions with an elongate vascular-bundle scar. Cones are bisporangiate; each sporangium contains a single tetrad of megaspores (2 mm in diameter) of the Triletes type and microspores assignable to Zinjisporites . 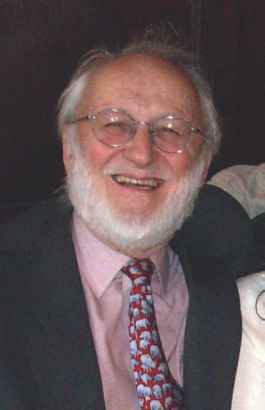 figure 9.99 Barry A. Thomas. One of the few permineralized lycopsids known from late Paleozoic rocks of Gondwana is Eligodendron (Archangelsky and de la Sota, 1966). The single specimen comes from the Permian of Bolivia and possesses a parenchymatous pith and exarch primary xylem. 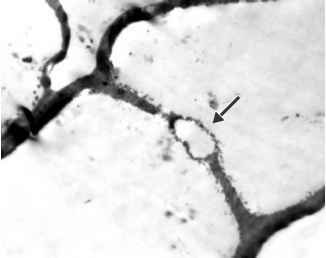 The cortex is three-parted with large lacunae in the inner zone. The specimen lacks evidence of ligules and parichnos tissue.